Do you want to give your customers an exceptional experience? Toll-free number solution can help you. Toll free number allows your customers to contact you without any charge. This number encourages people to call you and ask their queries. Your business must have a toll-free number services if you want to improve your customer service. But you must ask one question: Which tollfree or cloud telephony service provider is good for you? Not familiar with any company? Don’t panic! 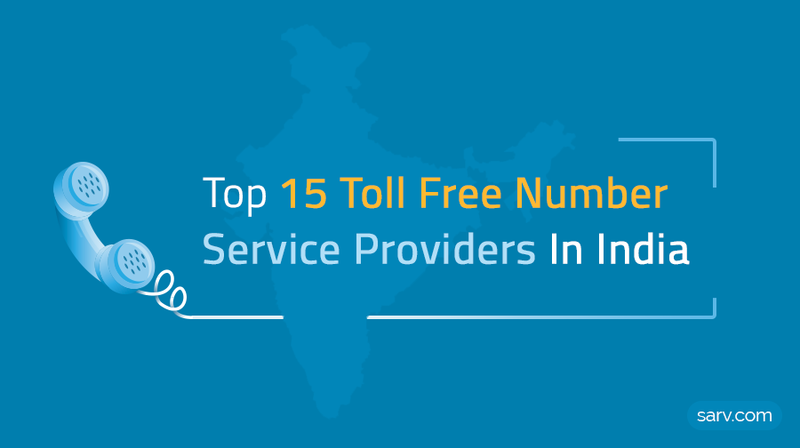 In this article, you’ll find top 15 toll free number service providers in India (In no-order!). If you’re looking for a reliable toll free provider company, then this list make your choice easy! 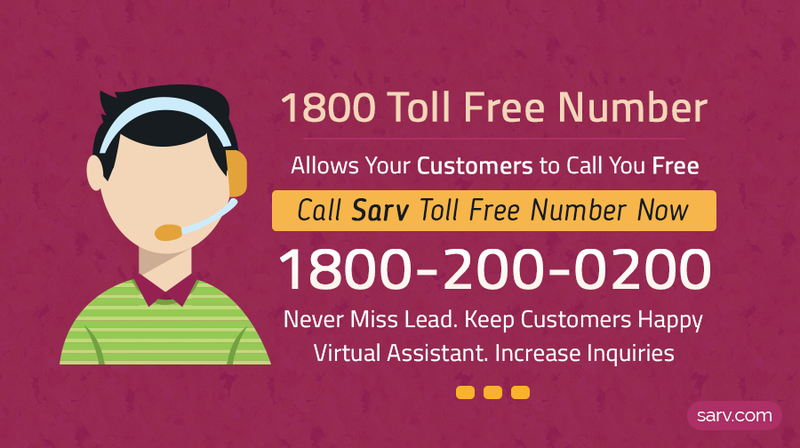 Sarv.com is a leading cloud telephony service provider in India. Sarv’s cloud telephony services – Toll Free Number, Voice Solutions, and Virtual Receptionist expand your business around the world. They help you to create in-house cloud call center in minutes. Sarv’s Toll-Free number (With advanced features) fits all your needs and business requirements. Discover convenient and powerful way to connect with your customers, Give your customer convenience of dialing for your services. Good value for money. Knowlarity is another leading cloud telephony company in India. Knowlarity provides Cloud Telephony & Call Handling Solutions through various virtual phone systems in India and across the world. Knowlarity Products are: SuperReceptionist, Smart-IVR, Super Conference. LeadNXT is a niche product for today’s Marketing world where every single Lead counts, it’s a combination of Cloud Telephony, Web API and Lead management. LeadNXT Toll Free Number Service, boost your marketing efforts and improve your company image by offering your customers free and convenient way to reach you and push your business ahead. Ozonetel is a great cloud telephony service provider. It offers all the features that your business need to improve your customer service. Everything is web-based. No need to install any software or hardware. MyOperator is a Cloud Telephony Company based in India. It offers Affordable Telephony solutions to small and mid-sized business. MyOperator provides Toll-Free number with a smart Call Management System. Zeotel offers reliable & secure cloud based telephony solution. Zeotel offers services like Tollfree Numbers, IVR solutions, and Miss-call Alerts etc. Zeotel’s cloud communications solutions help thousands of businesses thrive in a new world of work. Ziffy deals in Missed call, toll-free 1800 numbers and virtual receptionist. Toll free service provides potential customers and others with a “free” and convenient way to contact businesses. It can help to build your brand image. OneRing is a cloud-based telephony platform widely used for call-back service, voting and mobile verification service by just a missed call. The Toll Free Number provided by OneRing can be used for effective client interaction at different stages of the business. This also offers ease of communication with the clients which also develop faith and confidence in them towards your business process. Exotel’s cloud communication solution can help you customize the business communication over call and SMS. They offer products like a virtual number, toll-free number, Voice API and automated calls. Build a better brand identity with Exotel toll free number. Callnet is one of a leading cloud telephony service provider. Callnet offering 1800 Toll-Free Number service which will help you to create a professional image and never miss a single business leads. Go2Market’s toll-free boosts your marketing efforts and customers feel valued. It is loaded with features and comes along with an intelligent call management system with a wide range of call routing options based on geography, time and day and IVR with load balancing functionality. PRP Services is the leading toll free number service provider in India, with all the features you require. They offer complete customization. They also provide voice solutions and missed call alert services. CallHippo is a leader in the Intelligent cloud-based virtual phone system for businesses and enterprises. They offer solutions like Toll-Free Number, Local Number, and Virtual Mobile Number. CallHippo helps you to grow your business and take it to a high level. YOCC enables you to create an in-house call center with feature-rich cloud hosted telephony solutions. Whether you’re a startup or SME, YOCC can be a good choice for you. They also offer a Virtual Number Solution to enhance your business and customer service. MCube is one of leading cloud telephony solution providers in India. They provide affordable cloud telephony services to manage your business calls. Easy to deploy and Customizable. Feature rich. Are you using any service provider which are mentioned here? Please share your feedback with us. Would you like to suggest any other toll free number service provider in India? We’d like to hear from you!! i want 2 start online grocery business? Thank you for sharing a such a nice information. SARV Private Limited is also a leading toll-free number provider in India. we need best toll-free number selection which can easy to remember. & also need best advance marketing auto tool features to handle multi-customer & data analyze report + cost effective per call + Best features require which another toll-free service provider gives. Hi, thank you for sharing nice information. Please add more name to the list that provider of toll-free numbers to businesses and enterprises in India.